Removing surface stains on your property can be tedious and time-consuming. Regular soap and scrub may not be enough to clean your fences, floors, or driveways. Save your time and effort by calling companies that offer pressure washing services in Uniontown, Ohio such as Wilhelm Power Washing Services. Our company has been providing pressure washing services in Uniontown, OH and other locations for more than 45 years. Over the years, clients have been contacting us to spruce up their decks, roofs, fences, driveways, garage floors, gutters, walls, and chimneys. We stayed long in this business because of our commitment to high-quality work and customer satisfaction. Other companies may offer relatively lower rates. However, these service providers may send untrained workers to do pressure washing services in Uniontown, OH. With the lack of experience, these workers may end up damaging some parts of your house such as windows and floors after they perform pressure washing services in Uniontown, OH. At Wilhelm Power Washing, we invest our time and money in training our technicians to make sure they deliver the best pressure washing services in Uniontown, OH. Our skilled employees pay close attention to every assignment for pressure washing services in Uniontown, OH. They are driven by excellence and passion for outstanding service. You may have tried using your own pressure washing equipment or probably rent one. However, those tools are not at par with the ones used by companies that offer pressure washing services in Uniontown, OH. These companies invest heavily in updating and maintaining their equipment to provide better pressure washing services in Uniontown, OH. At Wilhelm Power Washing, we see to it that we use only top-of-the-line equipment for our pressure washing services in Uniontown, OH. Your home’s exterior is the first thing people see whenever they pay you a visit. A filthy-looking facade may give an impression that your property is neglected. Pressure washing services in Uniontown, OH is one of the most efficient ways to make you property look more appealing and vibrant. Contact professionals, like our company, who do pressure washing services in Uniontown, OH to bring back your curb back to its glory days. You may end up wasting a lot of water by cleaning your garage, fence, or sidings when you clean those areas by yourself. 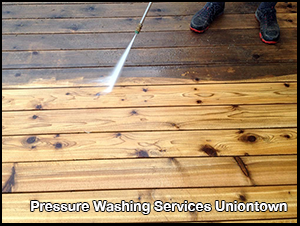 For more efficient pressure washing services, Uniontown, OH, contact professionals from Wilhelm Power Washing. Given our length of service, we know the most cost-effective and most efficient methods for pressure washing services in Uniontown, OH. Our trained professionals can make your outdoor space squeaky clean again with pressure washing services in Uniontown, OH. If left unattended, grime, mildew, and other impurities can cause irreversible damage to your home exterior. Without regular pressure washing services in Uniontown, OH, you may end up spending more money on repairs. Our pressure washing services in Uniontown, OH can help get rid of those contaminants and help preserve the beauty of your home. If you want to learn more about our pressure washing services in Uniontown, OH, contact us at 330-477-7094. You may also send us a text at 330-323-7466 to set up an appointment for pressure washing services in Uniontown, OH. We will respond to your message at the soonest available time. Email us at dwilh51183@yahoo.com to request estimates on our services such as pressure washing services in Uniontown, OH. In our years of professional service, we have built a reputation for promptness, integrity, and reliability. No matter what job you called us for, you can expect us to be open and transparent with you every step of the way.